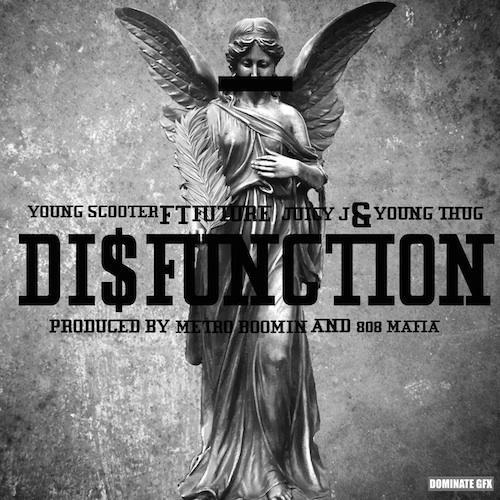 Young Scooter taps Future, Juicy J, & Young Thug for "Disfunction". Young Scooter has dropped a new street anthem with a stacked cast of features. "Disfunction" collects verses from Young Thug, Juicy J, and puts Future on the hook, while the beat comes courtesy of ATL production powerhouses Metro Boomin and 808 Mafia. Apparently Scooter will be releasing a new version of his first post-jail tape, Street Lottery 2, which will be called Street Lottery 2 Remixed. ScooWop will also appear on two new tracks from Future's upcoming sophomore album, Honest. No word on when his debut album, Juug House, will be available, but chances are there'll be more new music coming from the ATL rapper either way. Who has the best verse?